Split Large PST file into smaller PST Files with Date, Size, Folder, Year options. 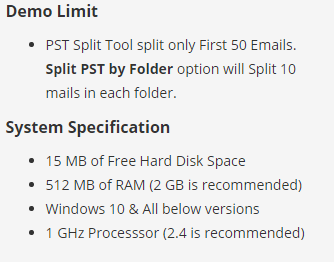 PST Split Tool gives No limitation on the PST file size. MS Outlook installation is necessary to cut PST file of large size. Now Tool Provides support for Corrupted PST files also. Split PST file by Year, Date, Size and Folder option. 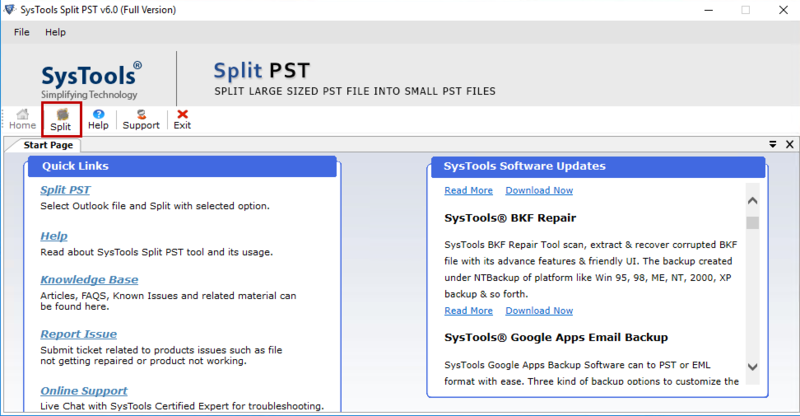 Avoid PST file corruption with PST Splitter freeware. Multiple Options to Cut PST Outlook file items: Emails, contacts, calendars, Tasks. Split Large PST file of Outlook 2016, 2013, 2010, 2007 & below versions. 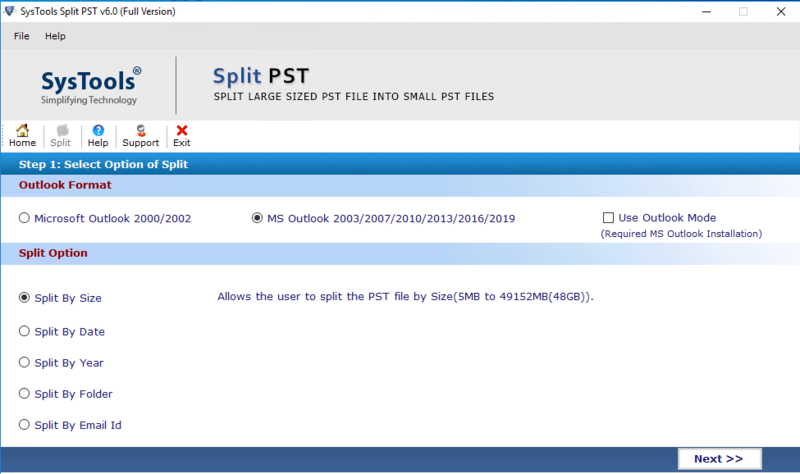 Split PST Software does the work of splitting large Outlook files into smaller and tool doesn't change meta properties of emails stored in the file and format of the file remains the same while splitting process. PST Splitter tool gives 4 different modes to cut PST Outlook file which is: by date, size, year & folder. 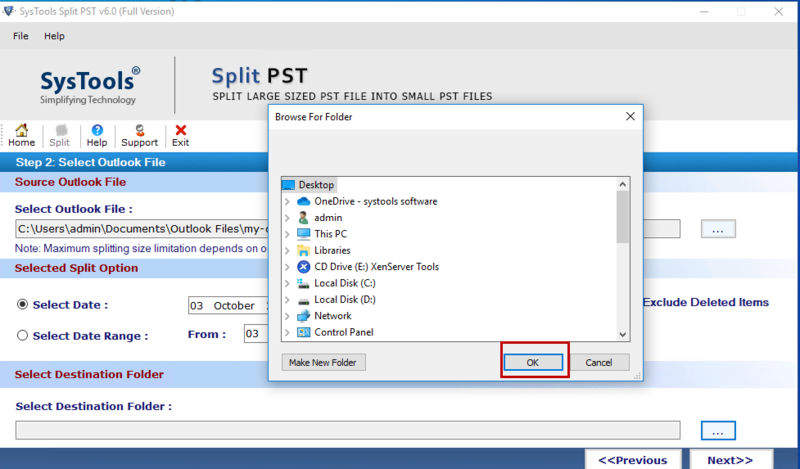 User can select the desired mode in tool to split Outlook PST File according to their convenience. PST Split Tool splits the Outlook file into 2 parts, one part contains the data prior to the date while the second part contains data after the date. Cut Outlook file into smaller ones with the option to select file size range from 5MB to 10GB and PST Split Tool will cut the large file into required size. 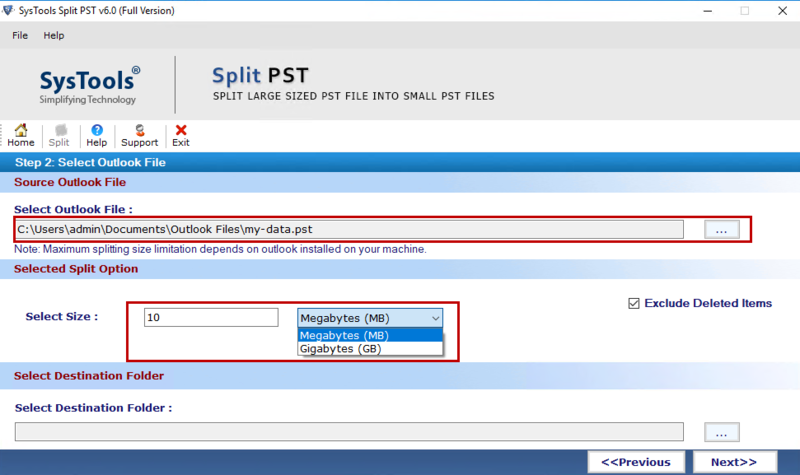 PST Splitter divide the Outlook file to year wise into multiple small size files. User can use tool to split large pst file and Separate PST file is created for different years. Break PST file of Outlook into different small files from the main folder. For example Inbox.pst for inbox folder, contacts.pst for contacts folder, Outlook.pst for Outbox folder. With the help of PST Splitter Tool, Microsoft Outlook user can Split Large Outlook PST File into smaller PST File. Tool equips with necessary prominent features that help user to divide .pst extension file properly. A user can split the file according to Size, Data, Year and Folder. A tool is designed in such way it supports large PST File of different Outlook 2013/2010/2007 & below versions. Different Outlook format having a different size limit and whenever size reaches over default file size limit, different issues occur related to Performance and Speed of the Outlook application. Even large size of PST File leads to corruption issues. To avoid various kind, user can Download Professional PST Split Software to manage the large PST file by splitting into smaller PST format. MS Outlook – Outlook 2000, 2003, 2007, 2010(32/64 bit), 2013 (32/64 bit), 2016 (32-bit). Install Software and click on "Split" option to start procedure. Choose the Outlook version from the below list. Choose the split option from the list as per your need. Browse the PST File within the system to split in small size. 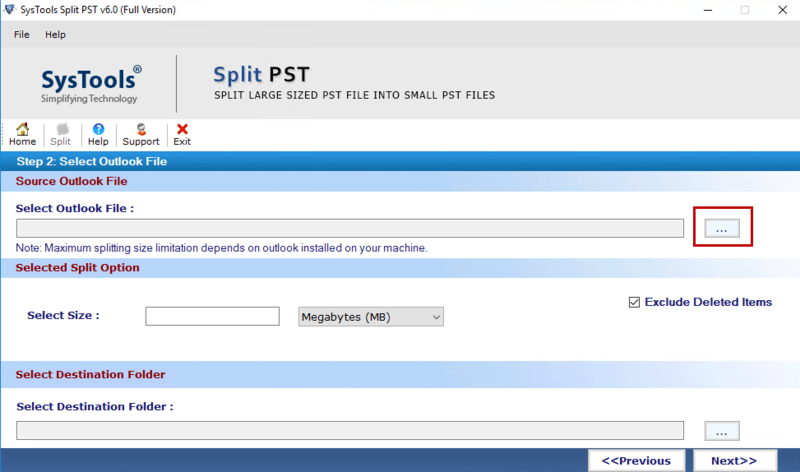 After selecting the PST file, Select the Size Range to divide Outlook PST File. Now select the Location to save the Splitted file within the system. Click on Split option to start the process of Splitting. When File splitted Completely, User can save report of process in CSV Format. Now Borwse the location, where all splitted file stored within the system. Split PST Software- Replies All Doubts & Queries! Does the software supports Windows 8? Does the installation of MS Outlook necessary to break the PST file? 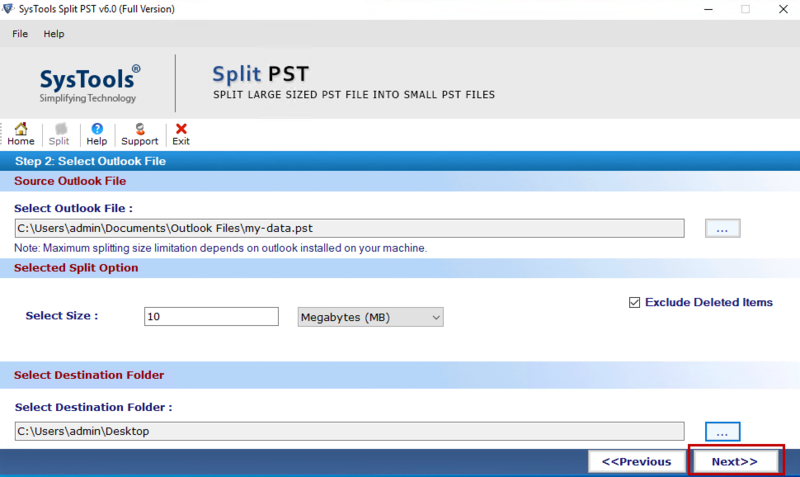 Yes, Outlook installation is a must on the system for PST Split Tool in order to divide PST file. Does PST Splitter Tool splits the corrupted PST file? No, the tool does not cut corrupted PST files into smaller ones as it requires a working PST file on Outlook. Is Split PST software change any meta-data information related to PST File? No, the Tool never change any meta data related to Outlook PST File during splitting process. Can Software split Offline Storage Table File of Outlook? No, Software only developed to divide PST File specially, but you use go for Split OST File to split Outlook File. I was searching for a software tool which could split large PST file of MS Outlook into multiple small PST files for my recent emails backup. After using Split PST Software, I was satisfied with the overall quality of the product. Thanks to the developer! I had a large PST file configured in Outlook which i wanted to break into smaller ones for my office purpose. I checked the PST split free demo while searching online and made the full version purchase later. Good tool to cut PST files into small size. After not getting the accurate solution of "How to split PST File of Outlook". 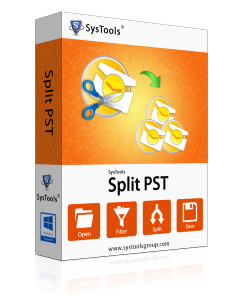 Try the demo version of the PST Split Tool. My Large Outlook PST file is split by Software without any data loss. While searching method to Split Large PST files freely on the web, find the tool. 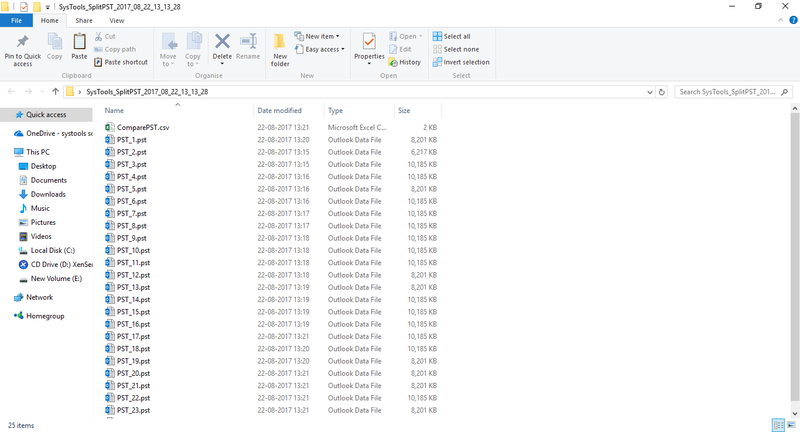 It not only offer an option to divide the big Outlook PST file, but I also can divide the file according to Year and Data and according to Folder also. 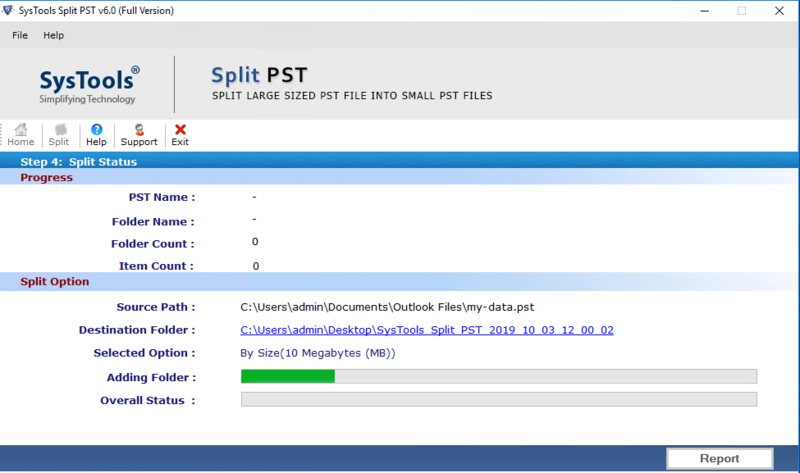 All in One tool to split Outlook PST File.